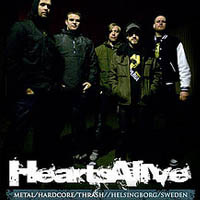 I couldn’t find much information about this hard-core metal band from Helsingborg, Sweden, but from one of their reviews on LastFm (one of the very few in English :P), I learned that they’ve recently went through a lead vocalist change and they sound even better then before! and let them know what you think. The link is updated now and it will take you to the Hearts Alive MySpace page – the link to download the album is right on top.